Loggerhead turtles have been on earth for more than 100 million years. They are protected by the EU Nature Directives but threats still exist. the sea right after getting out of the nest. Population: It is difficult to keep track of us as males rarely return to shore once they hatch, and females return only to nest. Scientists estimate that there are between 1,000-5,000 loggerhead females in the Mediterranean. My address: I live in subtropical latitudes such as the Mediterranean Sea, the Pacific, the Indian and Atlantic Ocean. My favourite food: I like to eat shellfish that live in the deep ocean. The main threats: Incidental capture (bycatch). In the Mediterranean over 132,000 turtles are caught in nets every year and over 44,000 die from incidental death. My way of life: I roll with the waves. My motto is ‘slowly but surely’. Life span: I can live up to 100 years. Who are loggerhead turtles? Why do they matter? What are the main threats? Find out more about this beautiful species. Read the stories of people who have found ways to make local development walk hand in hand with the protection of the loggerhead turtle. Read fascinating insights about the loggerhead turtle. 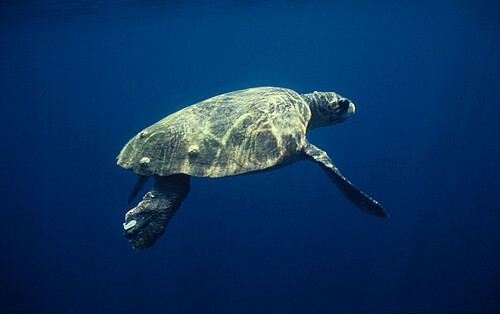 Did you know that female marine turtles return to lay their eggs at the same beach they were born?